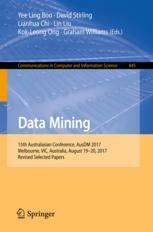 Data Mining, Yee Ling Boo, David Stirling, Lianhua Chi, Lin Liu, Kok-Leong Ong, Graham Williams (editors), Communications in Computer and Information Science, Volume 845, Springer, 2018. 15th Australasian Conference, AusDM 2017, Melbourne, VIC, Australia, August 19-20, 2017, Revised Selected Papers. Advances in Data Mining: Theory, Methodology, Techniques, and Applications, Graham Williams and Simeon Simoff (editors), State-of-the-Art Survey, Lecture Notes in Artificial Intelligence, Volume 3755, Springer, January 2006. This collection brings together the very best of the papers from the Australasian Data Mining Conference series. Proceedings of the 4th Australasian Data Mining Conference, Simeon Simoff, Graham Williams, John Galloway and Inna Kolyshkina (editors), 5-6 December 2005, Sydney, Australia. Held in conjunction with the 18th Australian Joint Conference on Artificial Intelligence and the 2nd Australian Conference on Artificial Life. Proceedings of the 3rd Australasian Data Mining Conference, Simeon Simoff and Graham Williams (editors), 6-7 December 2004, Cairns, Australia. Held in conjunction with the 17th Australian Joint Conference on Artificial Intelligence and the 7th Asia Pacific Conference on Complex Systems. Proceedings of the 2nd Australasian Data Mining Workshop, Simeon Simoff, Graham Williams and Markus Hegland (editors), 8 December 2003, Canberra, Australia. Held in conjunction with the 2003 Congress on Evolutionary Computation. Proceedings of the 1st Australasian Data Mining Workshop, Simeon Simoff, Graham Williams and Markus Hegland (editors), 2 December 2002, Canberra, Australia. Held in conjunction with the 15th Australian Joint Conference on Artificial Intelligence. Further information from the AusDM Steering Committee via sc@ausdm.org.